Another post that seems to have coalesced from wildly unrelated items – my father’s birthday last week; reading forwards from the old mydaftlife post that George Julian retweeted; Rose Tremain talking about her short story The American Lover. This year marked the seventh time that my father’s birthday has come and we have been unable to celebrate it with him. I still have – in my ‘bitties’ drawer – the now-yellowing card that, a few months before the date, had caught my eye as the perfect one for E and G to send to him seven birthdays ago. It shows a gang of short-trousered schoolboys, probably his approximate contemporaries, playing cricket with an oversized bat improvised from a roughly carved plank, with another plank as wicket. Quintessentially English, long on ingenuity, big on fun, short on material resources in childhood; it was my father to a T. ‘It’s your birthday, Grandad’, says the inscription, jaunty as the lads’ smiles. ‘Hope it’s a big hit, just like you!’ I don’t know what to do with the card. E and G don’t have another Grandad to send it to, and I can’t bring myself to throw or give it away. So it sits there, and every so often I catch sight of it and am reminded of a time when…. George reminded me of a different time when…, the time when the mydaftlife blog had the fun of LB’s contributions and Dr. Ryan’s street photography. Following the ‘Previous’ and ‘Next’ buttons from the highlighted June 2013 post, I revisited cyclists, statues and coffee, cake, chat and choice scenarios. After 15 months of relentless bureaucracy and grinding inhumanity, I had almost forgotten the happy breeziness of the blog, back in the day. Rose Tremain’s inspiration for her story, she said, was, “How our lives turn on little pivotal moments, what Wordsworth called ‘spots of time'”. Apparently, her protagonist, Beth, has a teenage affair with a much older man, which causes her life to veer off in a wildly unexpected direction, only to be upended again when the lover leaves. She finds literary success when she fictionalises her experiences, but fame is not a pleasant experience for her and later, a car accident causes another abrupt twist in her path. “I’m very interested in the idea that from this one moment comes all this wounding” said the author. The interviewer was more focussed on the idea that the piece was like a Russian doll – stories within stories, lives within lives. The ‘little-pivots -> huge (potentially disastrous) step-change’ thing seems to me to be such a truism as to be teetering on the edge of cliché. Little pivots like the moment in which some anonymous bod at STATT suggested that Connor’s tongue, bitten in an unnoticed seizure, needed Bonjela and closed the incident at that. The split-second in which a clinician decided, exasperatedly, that my mother’s repeated reporting of, and queries about, my father’s symptoms, were not concern but obsession; and therefore (fallaciously) concluded that Dad didn’t actually have any significant symptoms and wasn’t really ill at all. Of more interest to me is why, having made these apparently insignificant, on-the-fly choices, people seem trapped in their own commitment to them, even in the face of mounting evidence. NHS staff refused to recognise evidence of Connor’s epileptic seizures, even after his mother explicitly drew attention to the signs. Clear pointers that there was something far wrong with my father’s health seem to have got lost somewhere between his oncologist and his infectious disease consultant. Nico Reed’s therapies were not reinstituted despite his weight loss and mood changes. Steven Neary was kept on an ATU in the face of his clear desire to go home. At the time of writing, Claire Dyer is sequestered in a psychiatric facility hundreds of miles from home, and is subject to a punitive behaviour-modification regime, even though she has autism, not a mental illness, and up until her transfer was safely spending extended periods of time out in her supportive local community. Why is it so hard to take a step to the side and say, “Actually, not sure that was quite right. Let’s think again.”, instead of remaining with both feet planted in the chute that plummets, at an ever-steeper angle, towards the pit of disaster? 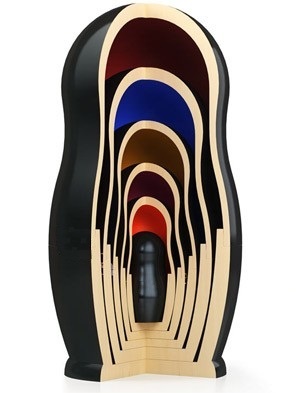 But the thing that really caught my attention was the image of the matryoshka doll: lives within lives, and, it occurred to me, at each step-change, the lives getting smaller, more restricted. It is not just the life of the main protagonist that is reduced, confined to a progressively more closed and isolated space or even, finally, a coffin and a grave. It’s not just Connor, Nico, Steven and Clare with doors slammed in their faces as they stood on what should have been the threshold of an expansion into young adulthood; not just my Dad, who could and should have been poddling happily and healthily through his eighth and ninth decades. It’s the lives of the people around them. It’s Dr. Ryan, in a life where she no longer has the time or the energy to focus her attention and her camera on tiny glimpses of other people’s lives. It’s my mother, permanently cut off from the man whom she had, for over fifty years, loved without reservation. It’s me, my siblings and our children, with the Dad/Grandad-shaped blank in our lives and the repercussions sending echoes of fear into our futures. It’s Nico’s parents and sister, ground down to ‘the dust in the corner’. It’s Mark Neary, living a life that consists almost entirely of care, work, care-work, care-paper-work, and inability to sleep. It’s Claire Dyer’s whole family, grinding back and forth along the weekly narrowness and exhaustion of the Swansea-to-Brighton corridor, in hopes of maintaining some semblance of a relationship with her. Multiple lives, and each of the multiple lives-within-lives a diminution; a deprivation of the bigger should-have-been lives. The metaphysician of St. Paul’s is as right today as he was four hundred years ago. What happens to an individual is not about just their one life. It’s all our lives.